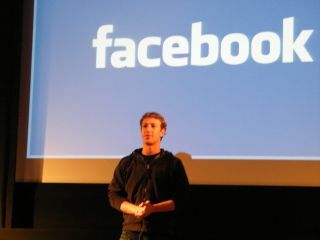 Mark Zuckerberg - doesn't he look a bit scared? Facebook's believed to be going public, which means that Mark Zuckerberg and his company will be beholden to the stock market for the first time. What's nice about the really successful tech start-ups, generally, is that the idea is the thing and the money is just a nice extra. Twitter, Spotify, Facebook, Tumblr... sure, they might be schilling around for cash now but when they started, the end product was the focus to the point where there was no real money making game. That's why they worked and that's why we all flocked to them. Passion – that's what makes a great product. Passion and straight-forward thinking. Know what the markets are passionate about? Money. Money and then some more money. While Facebook is already working on swelling its coffers, going public will mean it has to answer to outside shareholders who don't give a hoot about Facebook itself as long as the revenue comes flooding in. The pressure on Facebook to include ever more advertising will increase because if there's one thing share holders universally demand, it's a Y-axis filled with lots of big numbers and plot-points that move in a definite upward direction. And once you start making a lot of money, you have to keep making a lot of money. So more ads, more targeting, more mining of your personal inner-most desires and subconscious marketing intended to part you from your hard-earned cash. Obviously there's no guarantee that Facebook will go advertising mad. At the moment, its adverts are fairly unobtrusive, and although you might get more from brands you've 'liked', you can always unlike them and they'll go away. How long before that stops being an option once the company has serious financial targets to meet? What's more, there'll be new pressure to put Facebook's vast database of user info (that's all the secrets you and I have unwittingly told the social network about our likes and dislikes) to advertising work – and this will lead to ever more privacy concerns and a growing number of users ditching the service. Once public, Facebook's actions will be scrutinised by financial analysts instead of just bloggers. Now, I'm not one to knock financial analysts, but I'm pretty sure the bloggers know more about what makes a good social network than they do, so what effect will this hard-nosed scrutiny have on Facebook itself? Facebook apparently has an internal motto: "Facebook's only 1% finished". Elegant it may not be, but it is admirable in a tech company. The constant tinkering with profile layouts and new features might annoy users at first, but it's part of what's kept Facebook alive where its competitors have failed. Of course, it can go too far – maybe up that percentage to 10 soon, Zuck – but it's exciting. Having to answer to the markets could put an end to this kind of freewheeling experimentation. Any change that may impact its income in the short term is likely to be mercilessly abandoned – that kind of thinking is dangerous to a company that has always thrived on a hotch potch of new ideas. The similarities with Google are hard to ignore – before Google went public it came across as a cool young company that did what you needed it to and seemed to be sticking to its "Don't be evil" motto. Now it has fingers in every pie going, aping other companies' ideas and greedily Hoovering up any user info it can in order to increase its advertising revenue. Google Labs is out, Google+ is in. You might not notice it at first, you might not notice it for a year, but as far as Facebook goes, the glory days are behind us. It's all downhill into corporate doom and marketing speak from here on out.